By equipping bedroom, we expect to get comfortable and cozy room in which you can forget about all problems and fully rest. It should be noted that modern design of bedroom 2019 is based not only on fashion trends but also on needs of person in healthy deep sleep and quality rest. Bedroom is the most peaceful place in apartment, where we spend third of our time, is important element of interior and should harmonize not only with inner world of owners but also with other rooms. Let’s find out modern bedroom design 2019. 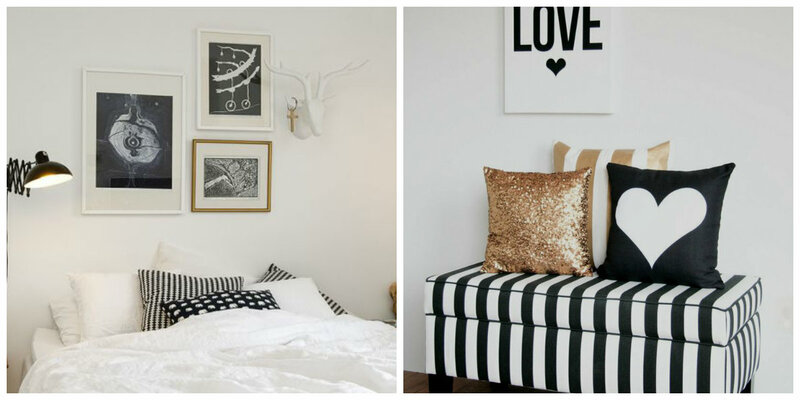 Black and white interior is simple and stylish modern bedroom design 2019. 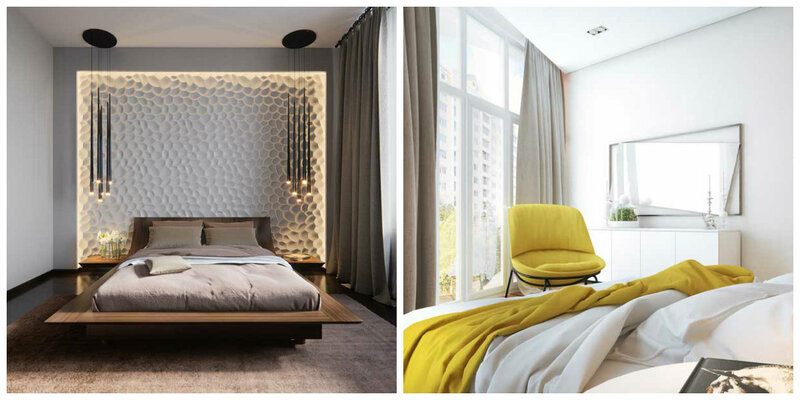 Minimalism made in this color scheme will allow you to relax and concentrate. If there is desire to fill bedroom with light, ceiling finish and painting of walls are better done in plain white color. 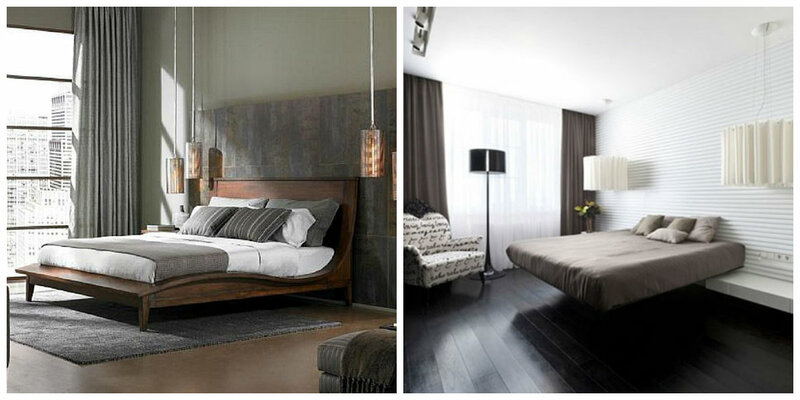 Floor covering in such decision must necessarily be combined with black furniture and be only couple of tones lighter. Glossy or matte laminate in gray color is ideal here. 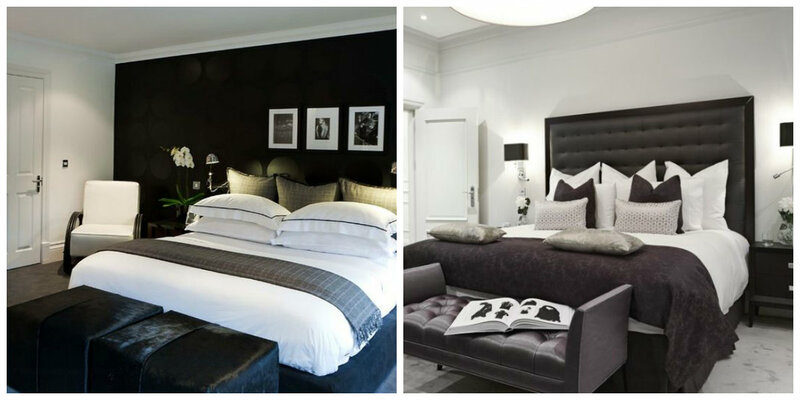 Main rule for furniture in black and white bedroom is closet, chest of drawers, bedside shelves or pedestals should be in same color in white or black and with same style. With help of contrast games – light walls and black furniture, you can achieve amazing effect. It’s very important to take care of lighting, especially if bedroom is more stressed in black, otherwise, it will be too dark and closed. 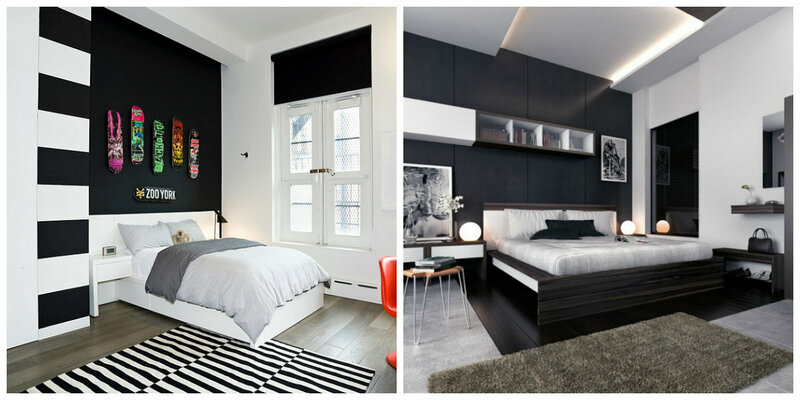 Good choice will be two-level stretch ceilings with built-in lights and bedside sconces, made in simple style of black. It’s wonderful option to make room especially refined. Large windows to floor will fill space with enough natural light. Bed linen and decorated pillows are best to choose in warm pastel colors. Decor is perfect for couple of figurines in avant-garde style. In modern bedroom design 2019, nothing is more important than comfort, practicality, and fresh design solution. Choice of finishing materials and colors doesn’t have boundaries, but best of all let them be natural. Wallpaper still remains classic in decoration of walls, but instead of usual traditional pattern, matte texture of dark gray color will be good choice. 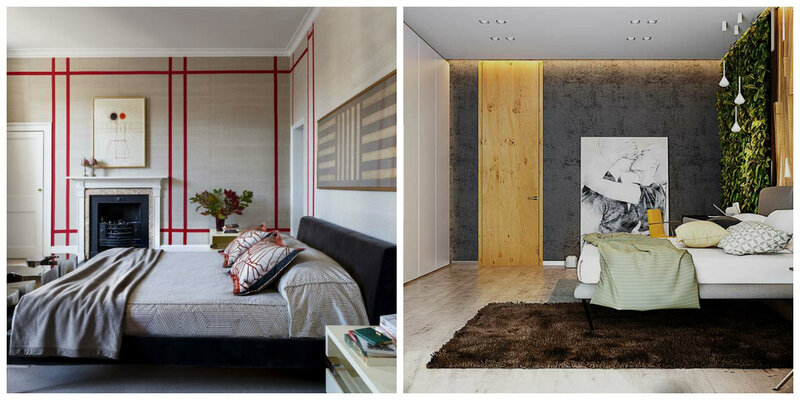 For interior decoration of walls will serve wooden panels, which will give presentable and warmer appearance. Most often, these panels are used near head of bed. For floor covering parquet board from natural materials will approach. Central furniture is bed. Bed is best chosen with sturdy frame and orthopedic crate, which will allow back to relax after hard day’s work. In addition, in practice of modern life, bedroom doesn’t only place for rest, so we may need another functional area for work. On photo of modern bedroom 2019, you can appreciate idea of placing small stylish table and chair. Excellent modern idea will be replacement of bulky bedside tables on elegant bedside table. This option will undoubtedly add room airiness. Today’s trend is built-in plasma TV, which saves space in full. Style of minimalism speaks for itself: simplicity and brevity in all its details, this is main rule. In decoration, furniture, and decoration, three natural colors are in use. Often it’s white, gray, black. Also, another color palette is possible, sometimes designers work with only one color. 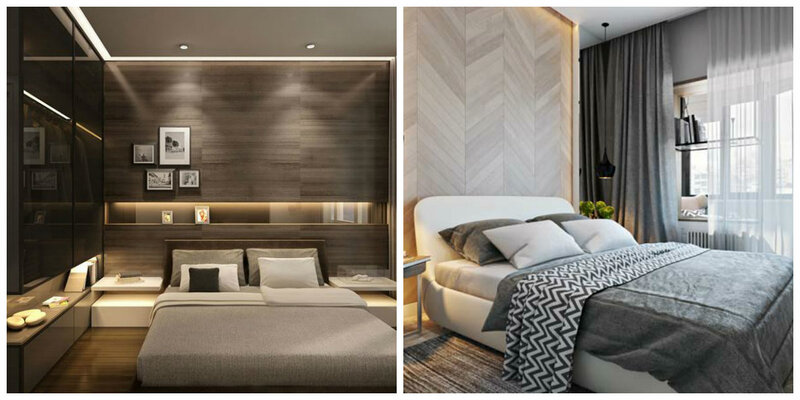 Main requirement is to decorate walls with neutral monochrome color without any drawings and ornaments. Use Plaster or paint as wallpaper. Floors combine with walls. To do this, it’s better to choose light parquet or laminate, diluted with dimly expressed pattern. Such floor covering will create sense of spaciousness and visually expand room. 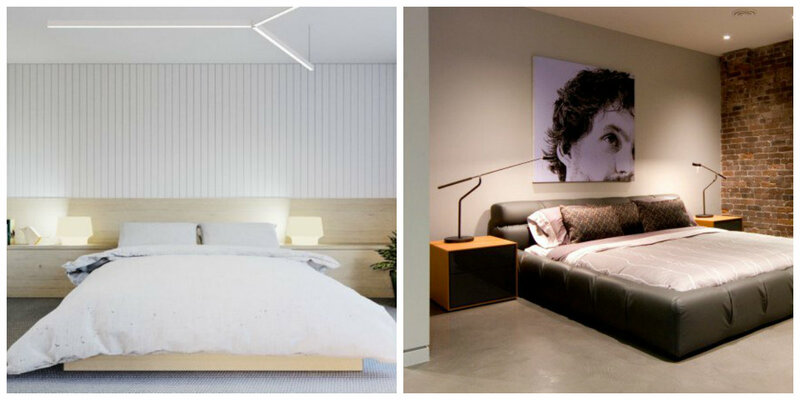 Stretch ceilings with precision luminaires are the best solution for bedroom in minimalist style. Dilute predominance of white color will help furniture. It’s better if it’s much darker, for example, black. Design of bedroom 2019 in style of minimalism can be considered as bed of tatami with built-in long shelves with no extra details, legs, and back. In addition, bed linens choose monophonic and better, so that it perfectly fits with bed. If tatami is black, bed will be appropriately covered with dark gray color. Above head of bed, you can think of shelves for books.